It’s no wonder that Nha Tho Duc Ba Saigon still plays a major role in many of Ho Chi Minh City’s residents. Vietnam has almost 6 million Roman Catholics and is second only to the Philippines in the whole of Asia. 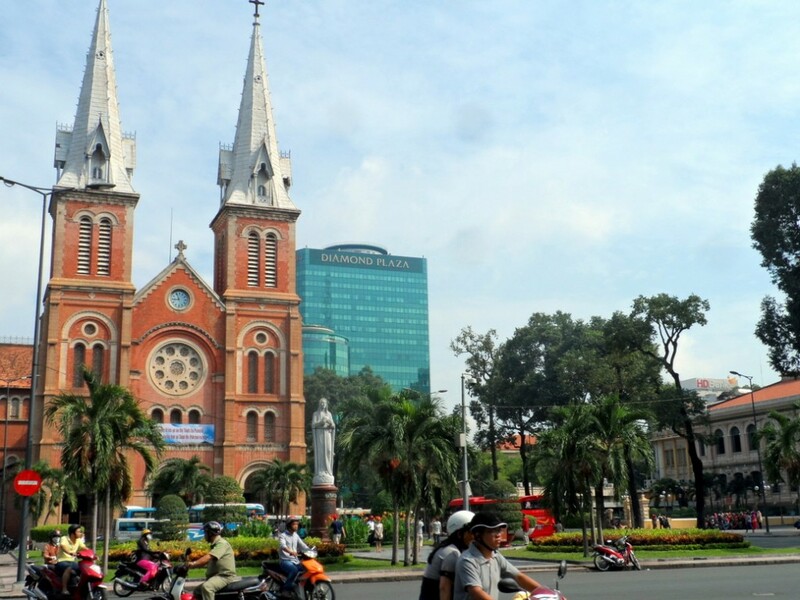 Nha Tho Duc Ba Saigon, otherwise known as Saigon Notre-Dame Cathedral Basilica, sits regally at Number 1 Cong Truong Cong Xa Paris Street, right opposite the Saigon Central Post Office It’s just across 30- 4 Park from Reunification Palace and diagonally across from Diamond Plaza. This makes it a convenient inclusion for any walking tour around Ho Chi Minh City’s major tourist spots. The current building was designed in the 1870’s by French architect J.Bourad. The previous church, on another site, had been severely damaged by termites and the French Colonists at the time obviously wanted the replacement to be something special. All materials were sourced from France including the bright red bricks from Marseille that still retain their vibrant colour today. The striking bell towers that soar to 58 meters weren’t added until 1895. They house 6 bronze bells weigh a hefty 29 metric tonnes. The crosses that top them rise a further 3.5m and weigh around 600kg. They were the highest structures in downtown Saigon at the time. Lucky the church foundations were actually designed to hold over 10 times the weight of the structure. When completed, the cathedral was thought to be the most beautiful in all the French Colonies. Directly in front of the church is a beautiful square with well tended garden beds and the imposing statue of Our Lady of Peace (Regina Pacis). The statue was made from granite in Rome and was shipped out in 1959. Once in place the church was officially renamed Notre Dame Cathedral. 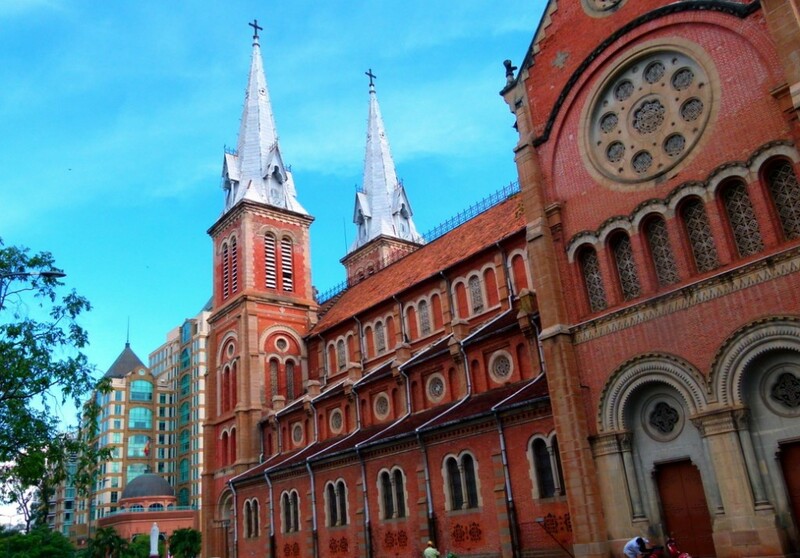 Then in 1962, Pope John XXIII anointed it Saigon Chief Cathedral and conferred the status of Basilica. Thus the official name is therefore Saigon Notre-Dame Cathedral Basilica….A bit of a mouthful. In October 2005, the statue created havoc when it was reported that it was weeping. Thousands gathered in the square and traffic in the area was totally disrupted. Despite the Catholic Church’s repeated denials of a miracle it took quite a while to convince the faithful and disperse the crowds. The interior of Notre Dame isn’t particularly ornate when compared to many European Cathedrals but it does provide a peaceful haven from the busy streets outside and has a reverent atmosphere. Unfortunately many of the beautiful stained glass windows were damaged during the war and just a few excellent examples survive. Devotional tiles line the walls bearing witness to the many faithful in the city. If you want to contemplate the church in peace then go during the week. However, if you prefer to see it in full working swing, then attend one of the lively services on Sunday. 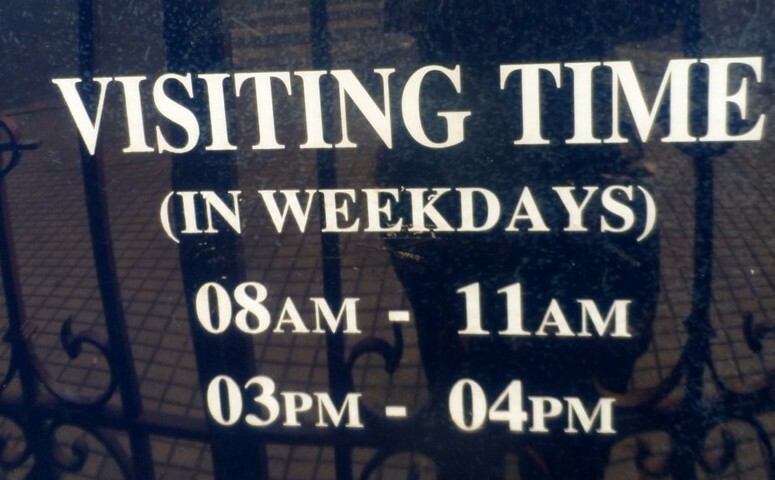 The one at 9.30am is held in English. One can only wonder at how many prayers have been offered by the faithful for survival, peace and victory over the years. Even if you can’t visit the interior the Basilica is still worth your time. The exterior provides excellent photo opportunities, as does the square. 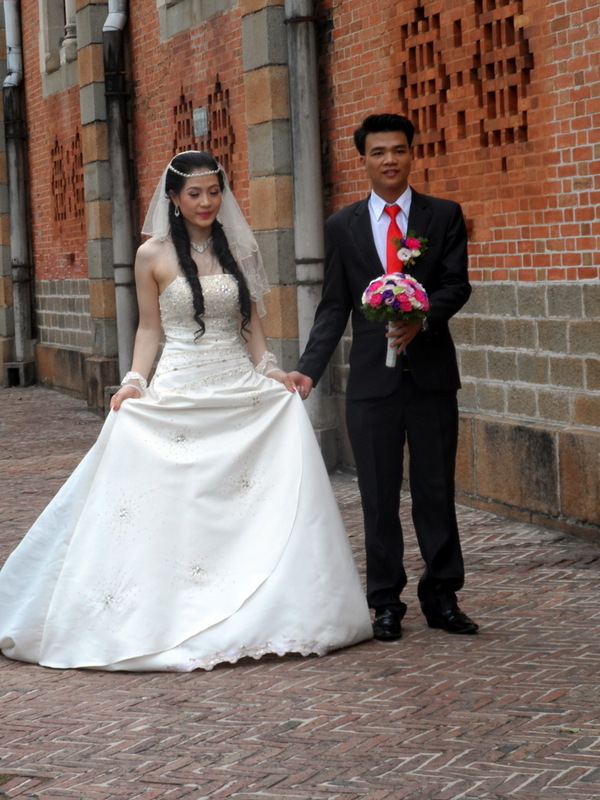 It is extremely popular with local couples for their pre nuptial wedding album and you are likely to see more than one beautiful bride and their entourage on any day of the week. Nha Tho Duc Ba Saigon is officially open to visitors between the hours of 8am and 11am in the morning and 3pm and 4pm in the afternoons. There are reports however that this can be a little sporadic. If the front entrance isn’t open, try the door around the left side (facing Reunification Palace. English speaking staff sometimes dispense tourist information from 9-11am. The church is free to visit but of course donations are most welcome.